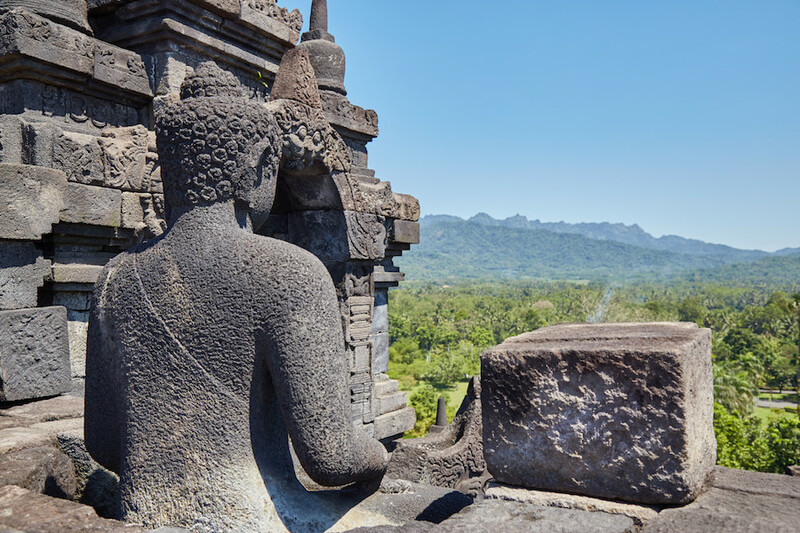 The ancient religious monuments of Borobudur and Prambanan are two of the most prominent landmarks in the Yogyakarta region, if not all of Indonesia. While both are relatively close to the city, the two monuments are actually in opposite directions. 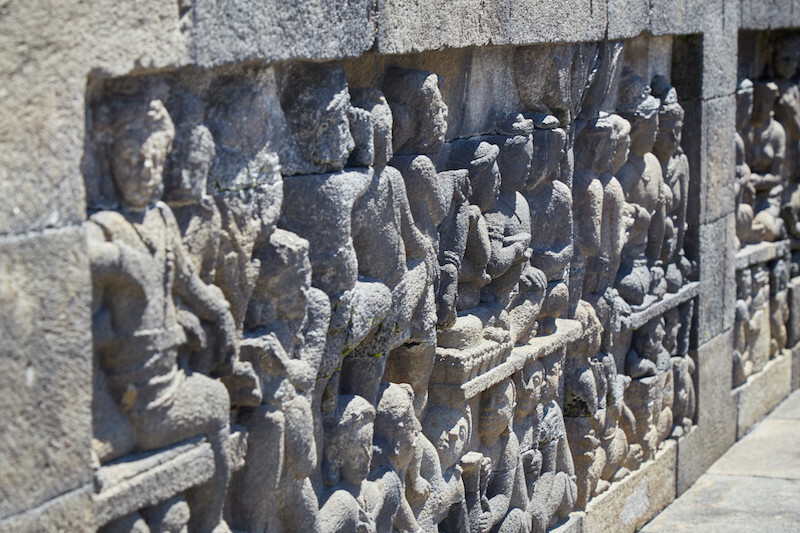 Most people visit the sights on separate days, or only make a trip to Borobudur, the more popular of the two. While somewhat long and tiring, I found a visit to both famous monuments in one day (with the help of a private driver) to be a worthwhile choice. Seeing them back-to-back becomes even more interesting when you realize that they were actually constructed at around the same time. Many summaries of Indonesian history will tell you that prior to the rise of Islam, Javanese society was predominantly Buddhist before transitioning to Hinduism. But the histories of Borobudur and Prambanan reveal that the two religions intermingled and coexisted for quite some time. The construction of the two megalithic religious structures in the 9th century A.D. actually happened just a couple decades apart. Therefore, it’s highly likely that they were in use at the same time. Just like how both monuments were constructed in the 9th century, they were also both rediscovered in the 1800’s – by the same person, in fact. A British statesman named Thomas Stamford Raffles, who served as lieutenant governor of Java, uncovered both significant landmarks during Britain’s brief rule over Java between 1811 and 1815. Shortly thereafter, the Dutch gained back control, and it would be several decades before any serious restoration effort took place. Flash forward to today, and the two sights continue to draw huge crowds of visitors on a daily basis. For such a large monument, Borobudur is hardly mentioned in any historical records. Details surrounding its construction, use and eventual abandonment remain shrouded in mystery to this day. 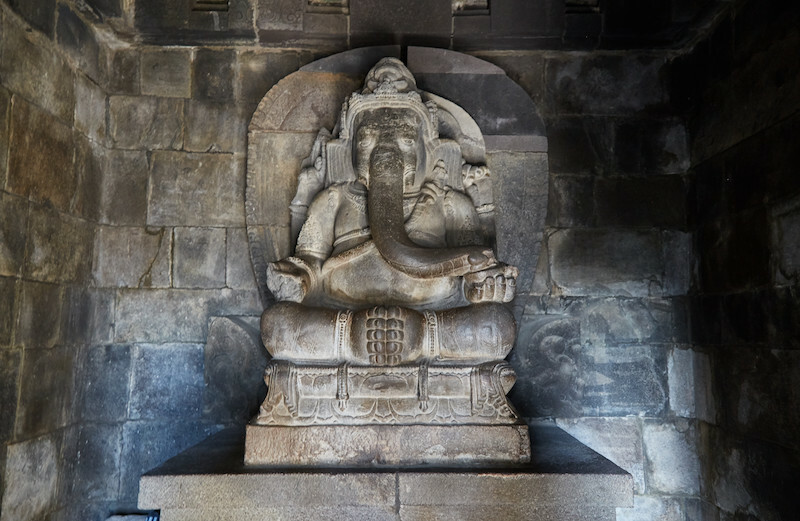 One legend suggests that the structure was built by a man named Gunadharma who now permanently resides in (or rather, as) a nearby mountain, overlooking his creation for eternity. A few legends also suggest that the monument was never meant to be climbed, and that those who made the attempt suffered from horrible curses. 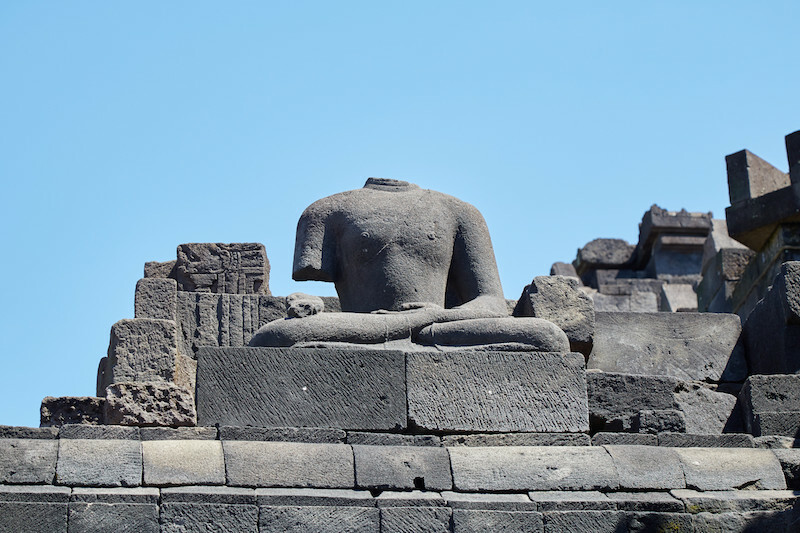 Even without records, though, there are plenty of details we can presume about Borobudur just by looking at Buddhist cosmology and philosophy. It’s highly likely that Borobudur was always meant to attract pilgrims, despite what some legends suggest. 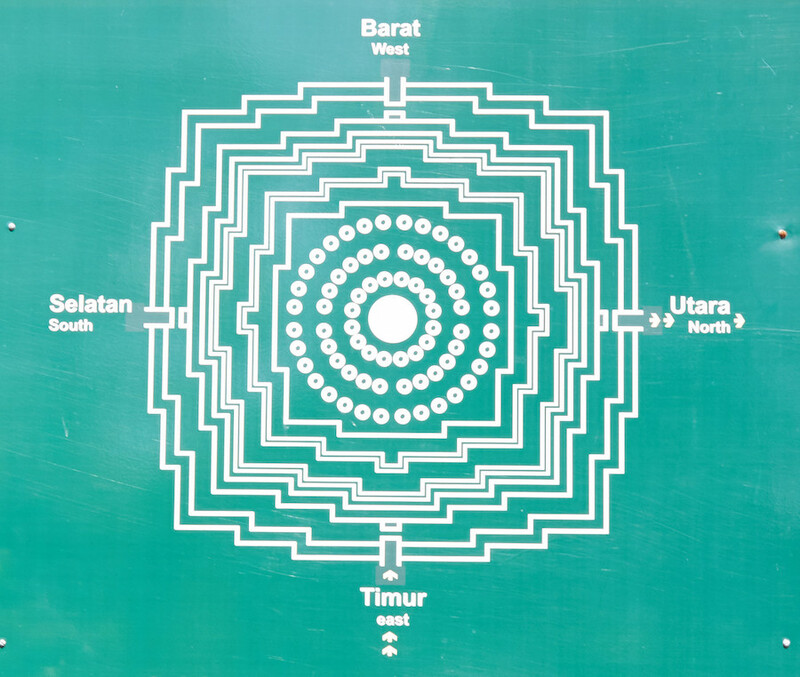 The basic structure of Borobudur is widely believed to represent the mythical Mt. Meru, a major part of both Buddhist and Hindu cosmology. Mt. Meru is considered to be the center of the universe, either on a physical or on a metaphorical level, depending on who you ask. Hindus often depict the top of Mt. Meru as the abode of the gods, while Buddhists tend to emphasize the highest level as a formless realm (i.e., nirvana). The mythical mountain is often depicted as one tall central peak surrounded by four smaller peaks on each side. 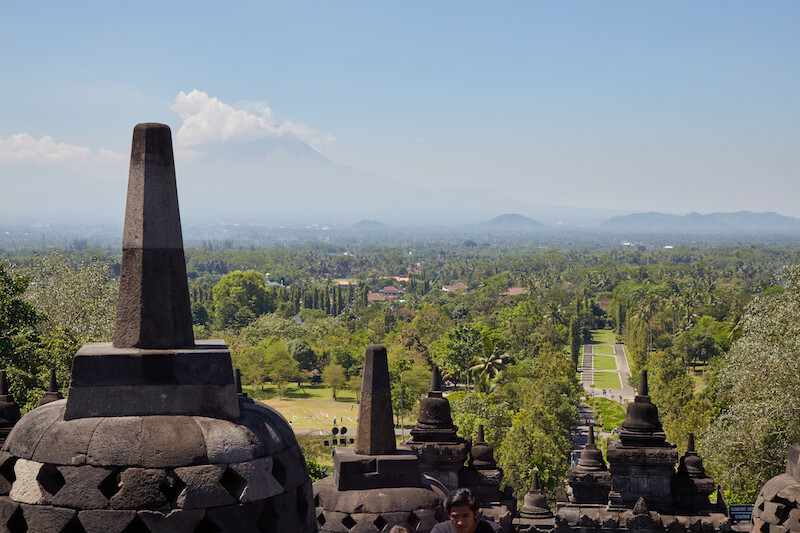 Interestingly, there are four mountain peaks visible from the top of Borobudur, although not directly surrounding it. Buddhist pilgrims are meant to walk around the monument in a clockwise direction as they observe a multitude of reliefs depicting either moral lessons or past lives of the Buddha. During your visit, you may want the help of a guide to help you decipher some of these images, as there are no signs with explanations anywhere on the monument. Just like Mt. Meru, Borobudur is considered to be divided into three sections: the realm of desire, the realm of form and the formless realm of enlightenment. The carvings at the lowest level depict the dangers of falling into the trap of attachment and desire. Meanwhile, the highest, formless realm is represented at the very top of the monument. 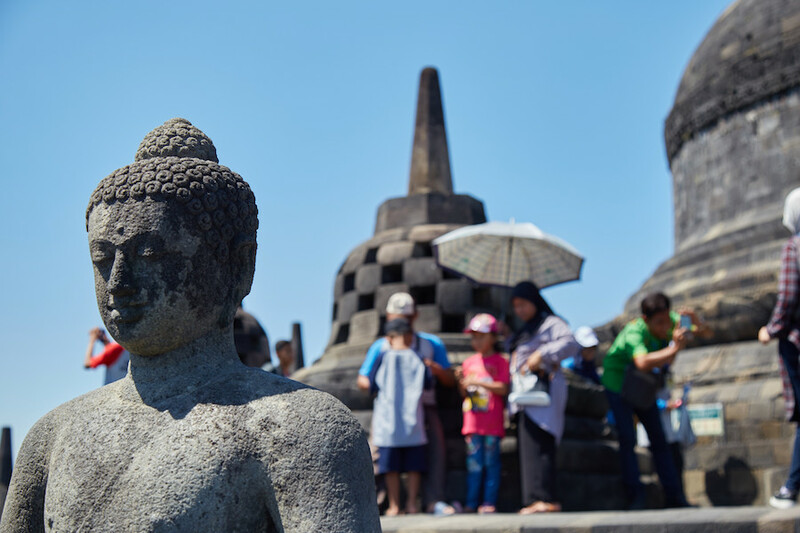 Instead of moral lessons, one can find Borobudur’s trademark stupas and even more Buddha statues. With a base of 123 by 123 meters, it’s hard to believe that such a structure was built without any mortar. 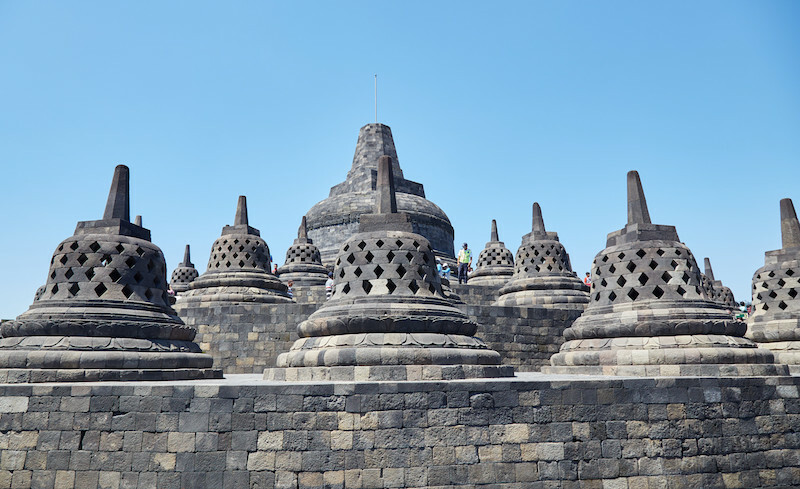 Consisting of over 2 million pieces of volcanic stone, Borobudur is truly an architectural masterpiece. 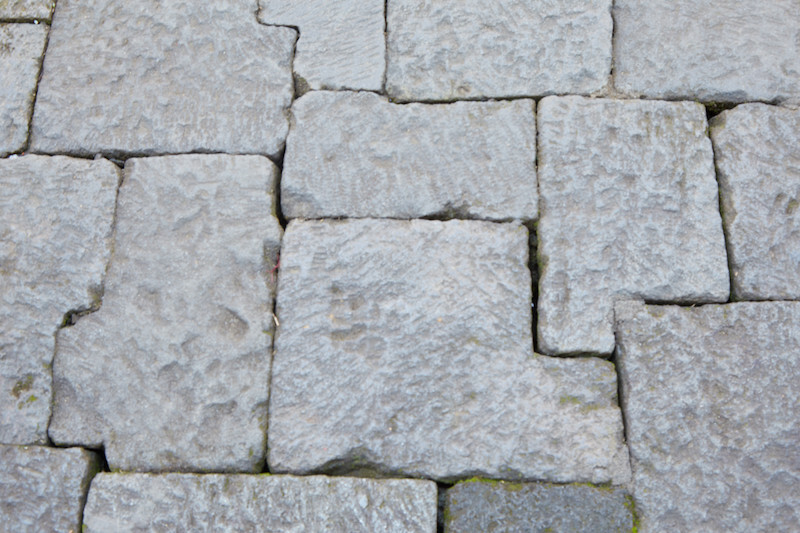 Some of the bricks are also very strangely shaped, reminiscent of other famous monuments from the ancient world. After seeing the colossal sight in person, it’s astounding to consider that such a large structure was once completely hidden by jungle and ash. A couple things you should know before visiting Borobudur is that it’s going to be very crowded and also incredibly HOT. Not only does most of the structure lack shaded areas, you’ll be walking around on top of black volcanic rock which traps much of the sun’s heat. Be sure to apply adequate sunscreen and wear a hat. As mentioned, you may want to hire a guide if you want to make more sense of the stories carved throughout the structure. Guides are fairly cheap, costing only around Rp. 75,000 for an hour of explanations. Looking back, I personally would’ve enjoyed the experience more without a guide, even if my group and I did learn some new things from her. Our guide tended to talk on and on, going off on tangents about unrelated things throughout the tour. Not only was it uninteresting to listen to, but we were often stuck standing in direct sunlight waiting for her to finish talking. At the end of the tour, it was obvious that she’d intentionally dragged on her dull explanations for as long as possible. “Excuse me, I’ve been talking for more than one hour so I’d appreciate a tip, please,” she said without any shame. This is despite the fact that we were actually in a hurry, as we had to make it to Prambanan later in the same day. That was just my experience with one guide, of course. You might have better luck with yours. Don’t let these photographs fool you – managing to get shots without hoards of tourists in the way was no easy feat! As mentioned Borobudur tends to get very crowded, especially so at the top. But do the large crowds diminish the experience? Honestly, yes, they do. It’s very difficult to find a decent place to take photos, not to mention just finding somewhere to stand out of the way of large tour groups. Furthermore, if you’re obviously a foreigner, you’ll be asked multiple times to pose in domestic tourists’ photos. Sure, people are very friendly about it and this is fine for the first few times, but past the fifth time it becomes tiresome. The large crowds combined with the stifling heat can make it difficult to fully take in and appreciate the magnificent structure. Don’t get me wrong, Borobudur is still worth a visit. You just might want to mentally prepare yourself for the experience in advance. Some people arrive very early in the morning to both see the sunrise as well as avoid the large crowds. 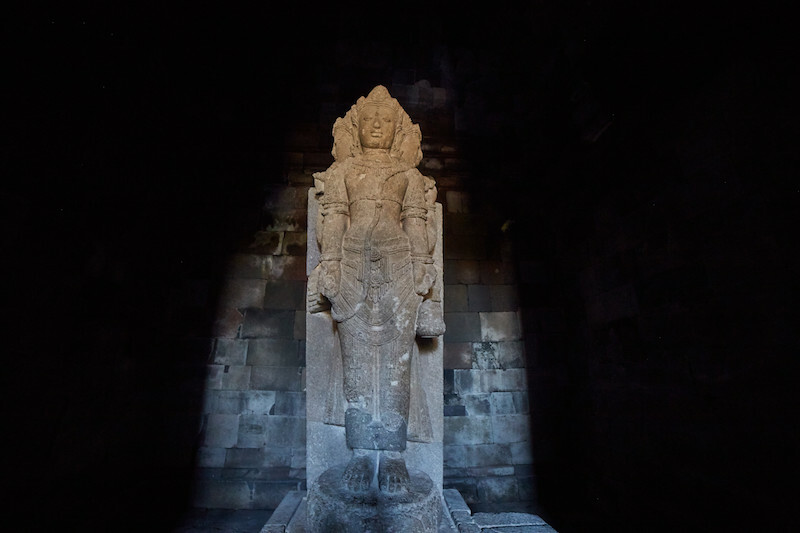 Learn more about the Borobudur Sunrise Tour just below. With the help of my hotel, I hired a private driver to take my travel companions and me to both Borobudur and Prambanan in a single day, including a stop for lunch in addition to a stop at another smaller temple for sunset. You should be able to arrange this for about Rp. 400,000. Strangely, if you want to go slightly off course to see some scenic rice paddies along the way, the price will typically jump to Rp. 600,000. This is the option my group and I chose, but while nice to look at, the rice paddies really weren’t worth the extra cost. Supposedly, there are also minibus tours available that can take you to both major sights for roughly the same price as a private driver, or just one sight for around half. It’s also possible to reach Borobudur by regular bus. You will first want to head to the Jombor bus terminal in the northern part of Yogyakarta. A round trip ticket from the city to Borobudur and then back again should cost you just Rp. 50,000, and the trip will last between an hour and an hour and a half. Of course, you can also rent a motorbike and make your way there on your own. A regular admission ticket to Borobudur costs Rp. 325,000. However, if you plan to visit both Borobudur and Prambanan, combined tickets are available for as little as Rp. 420,000. Just be aware that they’re only valid for two days. Don’t be afraid to ask someone at your accommodation if they can get you an even better price. It’s very common for people in the tourism industry to “know someone” offering a great deal. One of the most popular ways to experience Borobudur is at sunrise. As I had already seen a spectacular sunrise from the top of Mt. Merapi, and I wanted to see both monuments in a single day, I opted out of the sunrise package. Aside from waking up incredible early, those who wish to see the sunrise need to shell out Rp. 450,000 for the opportunity. These tickets are sold by the nearby Manohara Hotel, who will allow you access to the sight from 4:30am. Unless you’re staying at that hotel, you’ll have to leave central Jogja incredibly early if you wish to make it in time. I’ve both heard and read mixed reviews about the Borobudur sunrise experience. Some people mention that despite expecting to avoid the crowds, it was still very crowded at sunrise, and that waking up so early for the experience was not worth it. Others have raved about it and say that it’s worth every penny (or rupiah). It’s also possible to see the sunrise from nearby Setumbu Hill, for which admission only costs Rp. 30,000. But many people seem to feel that the view from the hill is too hazy and distant. As mentioned above, Prambanan was also built during the 9th century, just a short time after Borobudur. Many believe that the purpose of the structure was to commemorate the return of a Hindu dynasty to the region (the Sanjaya dynasty), even as Buddhism continued to be tolerated. It was most recently restored to its current condition in the 1930’s. Unlike Borobudur, Prambanan is not a single structure but an entire temple complex consisting of a couple hundred temples. According to legend, the complex once consisted of exactly 1,000 temples – all of which were built by a single man in a single day. As the story goes, a prince named Bandung Bondowoso fell in love with a princess, although she was reluctant to love him back considering that he’d killed her father. As a challenge, the princess, named Rara Djonggrang, told him that he could win her heart if he could succeed in building 1,000 temples by morning. Amazingly, the prince came extremely close to succeeding. That is, with lots of help from the supernatural. Just before Bandung Bondowoso and his team of spirits built the final temple, the princess and her servants burnt large bundles of hay, thus lighting up the sky. Thinking it was morning, the supernatural helpers fled before the last temple could be built. Frustrated by Rara Djonggrang’s scheme, the prince was so mad that he turned her into stone – instantly creating the final and 1,000th temple. Supposedly, one of the Durga statues in the Shiva temple is said to represent, or actually be, Princess Rara Jonggrang. 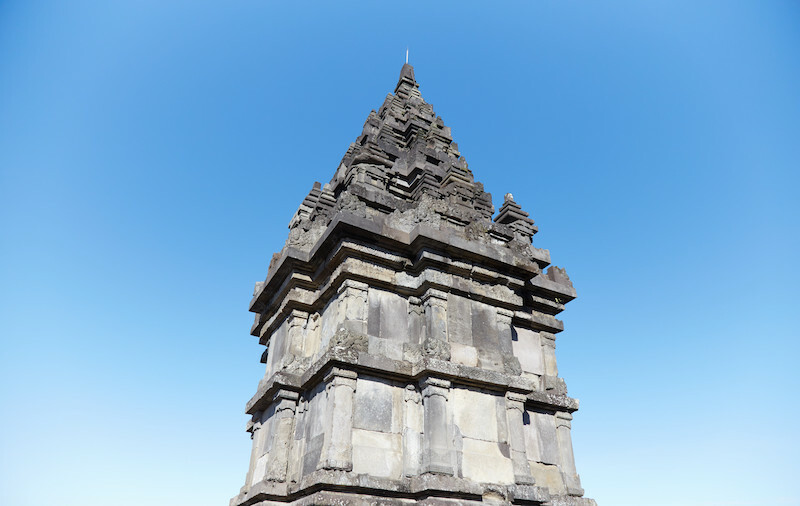 Prambanan was constructed as a Shivaite temple. Shivaism is a variety of Hinduism that puts the strongest emphasis on Shiva worship as opposed to other traditions like Vaishnavism, which views Vishnu as the ultimate deity. 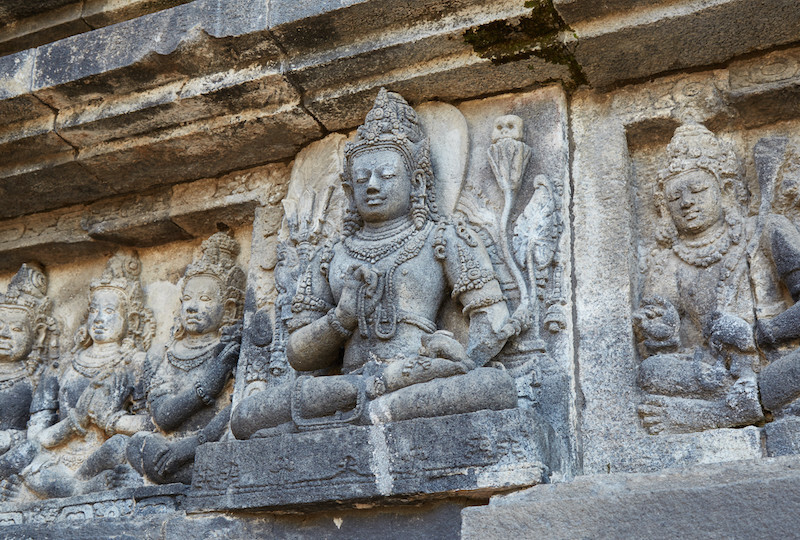 Though the strongest emphasis is on Shiva, as is common in Hindu architecture, structures were also built to commemorate the other deities of the ‘Trimurti’ – Brahma and Vishnu. The Trimurti is represented by the three tallest towers of the complex, with the tallest, for Shiva, standing at 47 meters (154 feet). Walking inside the structures, visitors can find statues depicting Hinduism’s main deities as well as some of their common incarnations. Ganesha, son of Shiva, "The Destroyer"
After the disappointing experience with the tour guide at Borobudur, our group unanimously agreed to not hire a guide at Prambanan. I have no regrets about this, as I really enjoyed exploring the temple complex at my own pace. 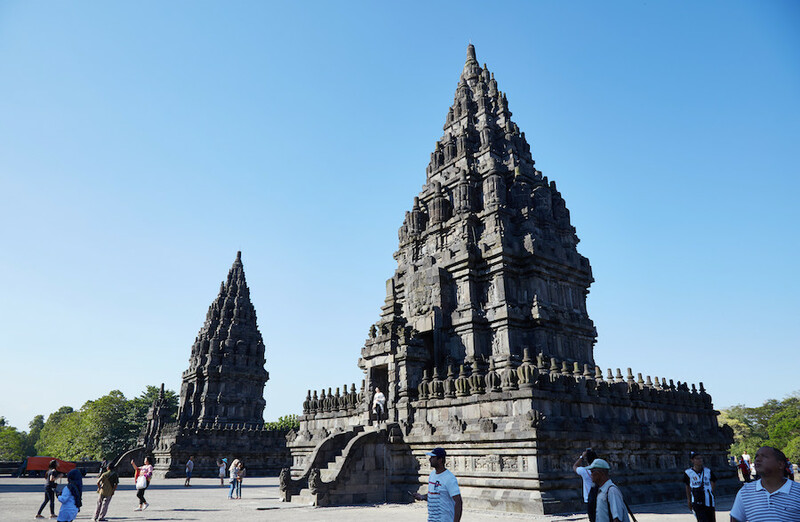 While it was still incredibly hot, Prambanan offers plenty of shaded areas and you can chill out inside some of the structures to escape the heat. Like Borobudur, Prambanan gets very crowded. Frustratingly, many tourists tend to block entrances to some of the structures as they pose for multiple selfies, which can really test your patience after awhile. At least at Prambanan, there are plenty of other structures you can go and check out while you wait for the photo shoots to finish up. Just keep in mind that the area is huge and it’s very easy to get separated from whoever you’re with, especially if they don’t have a phone. There are a few other old temples nearby Prambanan as well, but I ended up missing them, thinking my travel companions might already be back at the parking lot (they weren’t). I didn’t mind too much, as I was already “templed out” by that point – quite a rare thing for me! It’s also possible to reach Prambanan by regular bus. They leave every 20 minutes or so from Malioboro St. You want to take bus 1A, which only costs Rp. 3,600 for a one-way ticket. 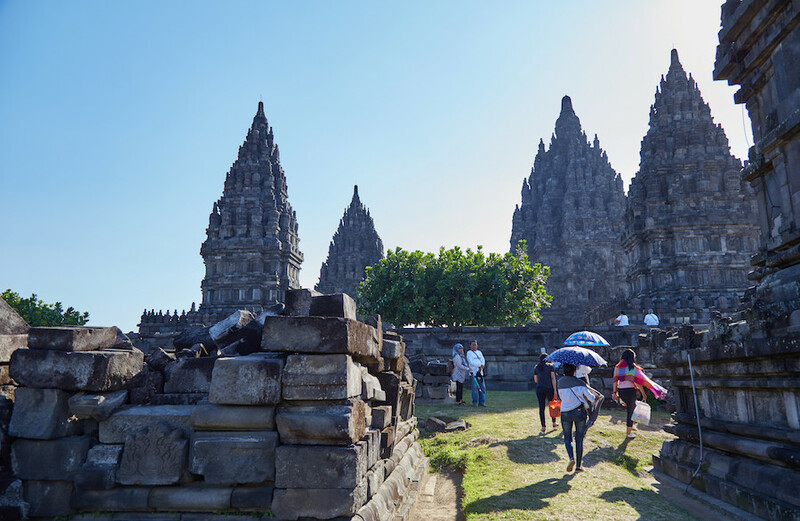 Prambanan is closer to the city than Borobudur, so the journey shouldn’t take much more than a half an hour. You can also simply hail a taxi from the street, and a round-trip ride from the city can be usually be agreed upon for about Rp. 120,000. A regular admission ticket to Prambanan costs around Rp. 250,000. However, if you plan to visit both Borobudur and Prambanan, combined tickets are available for as little as Rp. 420,000. I enjoyed both monuments and would highly recommend a visit to both for anyone visiting the Yogyakarta region. Many people, it seems, visit Yogyakarta solely to see these two monuments. In that case, I would say that Borobudur and Prambanan alone would not be worth the trip. There are so many other things to do in Yogyakarta, though, such as a climb up Mt. Merapi, sightseeing in the city or exploring art galleries. Borobudur and Prambanan are just a couple of the many things there are to do and see in Jogja, so plan for at least several days in the region. During my trip to Indonesia I also visited Bali, which definitely shaped my impression of the two monuments, especially the Hindu Prambanan. In contrast to Prambanan, which is an ancient ruin no longer in use, Bali’s Hindu temples are still very much alive and active. Bali is also home to plenty of spectacular temples, and after seeing what an important role they play in modern Balinese life, Prambanan felt somewhat dead and empty in comparison. All in all, though, I actually slightly prefer Prambanan over Borobudur. 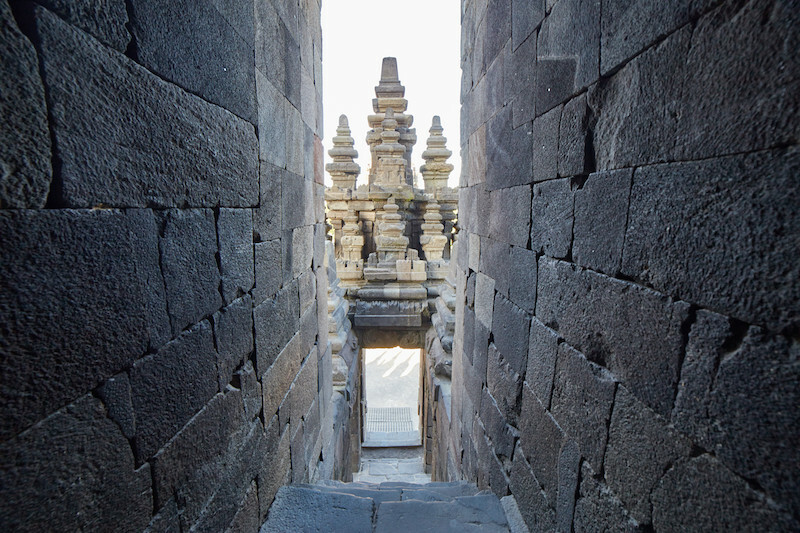 As massive as Borobudur is, there aren’t as many opportunities for exploration, as the structure features the same layout on all sides. Prambanan has various temples to walk in and out of, and you’re never quite sure what it is you’re going to find inside.